Hand harvested and selected grapes were frozen for 9 weeks at -10 degrees Fahrenheit before pressing in a Champagne press for over 6 days to obtain a juice of an average of 39.7 degrees Brix. Fermented coolly and in stainless for over four months, in order to retain freshness and varietal intensity. Released January 2013. 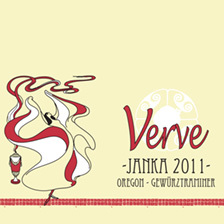 Sourced from selected sites at Anindor Vineyard and Mary's Peak vineyard, Verve’s Janka sweet wine has an extraordinary depth of flavor that marks the finest Gewurztraminer fruit from Oregon. Janka displays a beautiful golden color, and offers aromas and flavors of dried apricot and golden raisins laced with classic varietal “gewurz” spices of white pepper, fennel seed and coriander. In the mouth, this wine is lush and viscous and its exceptionally long finish evokes crème brulee with orange zest. Serve chilled, but let it warm and expand in the glass. Kept in the refrigerator, it will remain fresh after opening for up three weeks.